Parkcycle is open all year around although there are some days which we close (such as Christmas Day and when the park closes for the Ride London cycle event). The daily opening times do vary by season with the year is split into Low, Mid and High Seasons. The calendar below indicates the approximate opening times by season. Times can vary within this depending on the park’s closing time and the weather. On Monday through to Wednesday (inclusive) in low season, if the weather is poor we may be closed all day (so please check the twitter news feed for up to date information on opening times). On the days we are open in low season Parkcycle may close early should the weather be inclement, if you are planning to arrive later in the day and the weather is poor please check the twitter news feed or call to check. Note that the last one hour cycle hire is always at the latest around 90 minutes prior to the park's official closing time. Richmond Park is open to vehicles from 7:00am in the summer and 7:30am in the winter. Vehicle gates close at dusk all year round. (View vehicle gate opening / closing times here)"
Pedestrian gates are open 24 hours except during the deer cull in November and February. During these months, pedestrian gates open at 7:30am and close at 8:00pm. Bikes can be hired from Parkcycle by the hour for up to 4 hours. Prices vary by season with very low rates available in the low season periods! Please check the information below for rates by season (high, mid and low season). To work out how long you should hire for please have a look at our "planning your cycle" page as it is a good idea to allow sufficient time to enjoy your experience! We offer a range of discounts for booking in advance, small groups as well as schools and corporate bookings. If you are a large group or large family group we are also offer a group discount of 10% on your cycle hire charge provided that you are hiring 6 bikes or more. 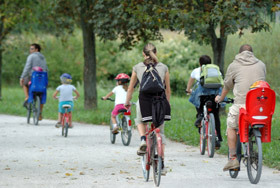 These can be any combination of bikes – adult/children/tandem/electric etc. If you also book and pay for a large group in advance, you will also receive the advanced booking discount too and this is added to the group discount for a total discount of 20%!!! Please note that late returns of cycles will require that an additional payment is due! The supplementary charge however is not onerous as we will only charge you to the next nearest quarter of an hour. For example, if you are 8 minutes late you will be charged only for the quarter of an hour (based on the initial hours hire rate). Please note we offer FREE HELMETS with every hire. All advanced bookings must be made and paid for at least 24 hours in advance of the hire. ** Corporate Discount applies to 12 or more bikes.